Biography of English Portraitist and Landscape Painter. Thomas Gainsborough, whose name is inseparably linked with that of the portraitist Joshua Reynolds, presents a contrast to him in almost every way. Hasty tempered and impulsive, Gainsborough was as intuitive and unconscious in his portrait art as Reynolds was conscious and sophisticated. He had no hankering after historical painting in the grand style like Reynolds or the Scot Allan Ramsay, he never visited Italy, and what he owed to the old masters was the result of instinctive sympathy, not of deliberate intellectual study. He had no love of respectability and institutions, and he considered himself first and foremost a landscape-painter, who was forced by economic necessity to paint portraits. No painter has been more entirely English in the sentiment of his work, and of all English artists he had the greatest natural genius as a painter. As a colourist he was the equal of Reynolds, and as a draughtsman he had precisely that sensitiveness to form which Reynolds lacked. Gainsborough said many times that while portraiture was his work, landscape painting was pleasure. In this article, we focus slightly more on his portraits and figurative works. Like the three other famous English landscape painters John Crome (1768-1821), John Constable (1776-1837), and John Sell Cotman (1782-1842), Gainsborough was a native of East Anglia, and, like them, he owed his earliest inspiration to the Dutch landscape masters. Born at Sudbury in Suffolk, the son of a clothier and shroud-maker, he early showed a love of art which was nursed by the beauty of the scenery around him. Before he was fifteen his talents were so obvious that in 1741 his father sent him to London, and entrusted him to the care of a silversmith whose name is now forgotten. While in London it is believed that Gainsborough studied first under the French engraver, Gravelot, and later at the St. Martin's Lane Academy, then under the direction of Francis Hayman (1708-76), a Devonshire painter of portraits and historical pictures, and one of the foundation members of the Royal Academy. A little later he set up for himself in Hatton Garden as a portrait and landscape painter and modeller for Italian image-makers. Presumably he was not successful here, for in 1745 he returned to his native town. In the same year he married Margaret Burr, the sister of one of his father's travellers, and shortly afterwards moved to Ipswich, where he remained till 1760, painting landscapes and portraits of local people. While at Ipswich he made the acquaintance of Philip Thicknesse, the governor of Landguard Fort, who patronized and befriended him. In 1760, on the advice of Thicknesse, he left Ipswich to seek a wider field for his talents, and set up his studio in the newly erected Circus at Bath. Here popularity and success soon came to him, and by 1768 he had made enough reputation to become one of the thirty-six foundation members of the Royal Academy. In 1774 he moved again, settling in London at Schomberg House, Pall Mall, where he at once became Reynolds's most serious rival. He was overwhelmed with commissions, and became the favourite painter of the royal family: (eg. George III, Queen Charlotte, Windsor Castle). In 1783, a dispute over the hanging of one of his pictures at the Royal Academy led him to withdraw his works, and he never exhibited again. In 1788 he developed a cancer in the neck, and in the same year he died, and was buried at his own request in Kew Churchyard, where a very simple stone marks his grave. Gainsborough's working life falls naturally into three periods of fourteen years each: from 1746-60 at Ipswich, from 1760-74 at Bath, and 1774-88 in London. Each of these three periods have their separate characteristics, but the distinction between the first and second periods is much more clearly marked than that between the second and third. At the beginning of his first period his handling is close and precise, both in his portraits and landscapes, and probably owed a good deal to the example of Dutch realist painters, many of whose works were in private collections in East Anglian houses. Gainsborough's landscapes are considered in more detail elsewhere, and here it will be enough to say that in them, as well as his early portraits, he shows a thoroughness and meticulous care which are quite in the Dutch vein. But even at this early time, before his most individual qualities had developed, there is a daintiness and elegance which is all his own. Some of his early portraits show a certain likeness to those of Francis Hayman, which supports the tradition of Gainsborough's pupilage to him. But Gainsborough was so natural and instinctive a painter that the influence of others upon him never resulted in imitation, and his reactions to art and to nature were equally personal. He never strove after originality, and certainly was never in any way a conscious revolutionary, and yet in some ways his fine art painting was more original than that of any other English painter. He referred to himself once in a letter as 'an original' in the sense that one may call a man 'a character' on account of certain irresponsible personal traits which make him a man apart. In the same sense he was an original also in his painting, which is permeated by a quality of personality unique and indefinable, yet as unmistakable as a man's handwriting or his features. Gainsborough's earliest known work has neither the freedom of handling nor the lively power of drawing with the brush which later became such marked characteristics, but before he left Ipswich a transformation had begun to come over his handling, and the Dutch meticulousness was replaced by a more lively but not less delicate touch which corresponded more exactly to his own apprehensions of nature. Reynolds, as we have seen, sought in his subjects some permanent and enduring quality, but Gainsborough's more acute and delicate sensibility made him especially conscious of all that is transient and impermanent - passing gleams which have gone before we know. The prosaic precision of Dutch handling could never render these rare and scarcely to be apprehended moments, but Gainsborough's instinct supplied him with a means to catch them on the wing. To catch them on the wing - but that is less than the truth, for it is the virtue of his art that it never gives us the feeling of life arrested, but of life that is passing, slipping by even as we look. This is what gives the poignant sadness to his painting, an unbearable pathos pointed, like Watteau's, with a gaiety beyond recall. But this pathos has nothing sentimental about it. It is unforced, and even unintentional. The pictures which Gainsborough painted of his two daughters as children, especially the one in which the two girls chase a butterfly (1755, National Gallery London), illustrate this quality more than his other early pictures. They show also his extraordinary sensitiveness to form, and the delicacy with which he could observe and record the most subtle variation of surface and contour. These and other oil paintings of children point again the contrast with Reynolds. 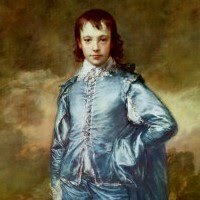 Compared to Gainsborough's the children of Reynolds are coarse and sentimental, and he imposes on them his own conception of happy childhood. They are often prettier, but they have not the exquisite fragility and unconsciousness of Gainsborough's children. By the date at which he was painting these portraits of his daughters, Gainsborough's powers of drawing with the brush were already highly developed, but a further freedom of handling followed his move to Bath. At Bath his style reached its highest development, and the flimsiness and carelessness which mar some of his later work had not yet appeared. His success at Bath was almost immediate, and the stimulus of success and the influx of beautiful, intelligent, and cultured sitters probably had as much effect in bringing about the change in his style as the influence of Van Dyck. He continued to paint landscapes as well as portraits, but his growing practice as a portrait-painter gave him less and less time for it, and after his early years at Bath he probably did not have much opportunity for direct study from nature. The characteristics of his mature work are an extraordinarily delicate perception of beauty and expressiveness in women's faces, a most subtle and unforced grasp of character, a sense of fresh and throbbing life, all expressed with unsurpassed freedom and lightness of touch in the thinnest and most liquid pigment. He had that happy knack of catching a likeness which Reynolds lacked, and of bringing a look of vivid life to a face by some passing expression which never becomes a fixed grimace. This faculty of vivid expressiveness was fully recognized in his own time, but he came in for some criticism on account of the look of careless freedom in his handling. It was objected that on a close examination his work resolved itself into meaningless scratches of paint. Actually the two things are closely interdependent, and the living, breathing quality of his painting is achieved partly by the freedom of his touch which prevents any rigidity of appearance. Reynolds, in his fourteenth Discourse, delivered after Gainsborough's death, recognized the importance of his great rival's loose suggestive brushwork, and expressed the opinion that his gift of getting a good likeness was largely dependent on it: that is, by suggesting rather than giving a definite statement he left so much to the imagination that each one could fill in the suggestion according to his own idea of the sitter. This is scarcely the whole truth, for at the distance at which the paintings are intended to be seen, the brush strokes fuse into unity, and give an impression of completeness. The likeness was given by his unerring grasp of essentials and delicate appreciation of form, his touch gave it that indescribable flicker of life which makes his work so unique. For some the best examples of Gainsborough's portraiture in England, see the National Portrait Gallery in London. The only oil-painter who can in any way be classed with Richard Wilson (1714-82), Gainsborough is the father of English landscape painting. His genius for landscape may have been equal to Wilson's, but the fact that he was forced to devote the greater part of his time to portrait-painting prevented him from developing his powers to the same extent. His early work in the careful and elaborate Dutch manner is atmospheric and true. The "Cornard Wood" (National Gallery) illustrates this phase of his work. It is full of close and searching study as were his other early landscapes. On this foundation of detailed study his later style was built. After he had moved from Ipswich to Bath the influence of Rubens superseded that of the Dutch painters, and, though the sincerity of feeling survives, his landscapes become actually more artificial in structure and colour. Trees of a warm rich brown give value to the blues of his skies, and the masses of his subject are arranged with a more deliberate art. Yet even when most influenced by others Gainsborough remains an instinctive painter. Though the manner may derive from Rubens there remains an inescapable sentiment which is his own. The subject-matter of his pictures is mostly drawn from the East Anglian scenes of his youth, and in his later work these scenes are invested with the association of memory. Gainsborough was never drawn to the classical school of landscape any more than he was to the 'grand style' in figure-painting, yet these pictures are in a sense ideal, and they are seen through the golden haze of happy memories, which gives them a similar sadness to that of his figure-pictures. This was Gainsborough's world of escape from the daily jars and irritations of his life as a portrait-painter, and it is full of an innocent rustic life which differentiates it sharply from the world of Richard Wilson. Wilson sometimes introduces figures into his landscapes, but they are in essence merely spots of light or dark, whose function is one of design only, but in Gainsborough the figures are the vehicles of sentiment and concentrate in themselves the vague longings which pervade his paintings. In his innocent and simple approach Gainsborough was the forerunner of John Constable. He has the same love of great masses of trees, and the same love of skies and moving clouds. If the paths of his life had been different he might well have forestalled the innovations of Constable's art, but as it was it was left to Constable and the tragically short-lived Richard Parkes Bonington (1802-28) to translate this intimate love of homely nature into terms which revolutionized the art of Europe. Gainsborough worked in water-colours as well as oils, and his sketches in this medium have a delightful dash, spontaneity, and breadth, but they, too, have an element of convention in them. They belong to the old master tradition of water-colour, and are sketches of arrangement and light and shade preparatory to oil-paintings rather than finished works of art in themselves. But this does not detract from their delightfulness, and beside Gainsborough's charcoal, chalk, water-colour sketches and soft ground etchings, the drawings of the early topographical draughtsmen look very timid and tentative. In later life, Gainsborough started painting idealized themes of rural life, such as "The Cottage Door" (1780), along with pictures of rural beggar children, gypsies and child labourers - sad and ragged but still well-fed. Occasionally his pictures became flimsy and formless. In any event, the business of professional portrait-painting irked him. He had little patience with boring and tiresome sitters, and he was too natural and instinctive a painter for this not to show in his work. On occasion he painted bad pictures, and it does no honour to his genius to acclaim these as masterpieces. At his best Thomas Gainsborough was a very great artist, and his pictures have qualities which may be looked for in vain elsewhere. The quality of his work was inimitable, and except in landscape he exercised little influence on the English school. From the beginning to the end he painted as his own exquisite sensibilities directed, and in no other way. His portraiture is represented in the Tate and the National Gallery in London, and in the best art museums around the world, like the Frick Collection NY.